All transactions are safe and secure with a reliable history in online purchasing behind each of our associates. Buy the Punisher Smoking Gun t-shirt to own Punisher clothing and merchandise. Take aim at this piece of Punisher apparel that displays a comic art design of the Punisher. Frank Castle's gun is smoking as he hunts down his enemies. This Punisher t-shirt is a great tribute to the character's comic origins, which date back to 1974. Pair it with your favorite skull design that displays the classic logo. The skull symbol was first sketched by Gerry Conway. It was later modified by Marvel art director John Romita, Sr, who blew up the basic design and added a gun cartridge for teeth. 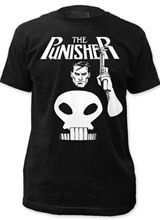 In addition to the Punisher Smoking Gun tee above, browse the Punisher Clothing Gallery for more apparel like men's and women's clothes, kids shirts or hoodies.